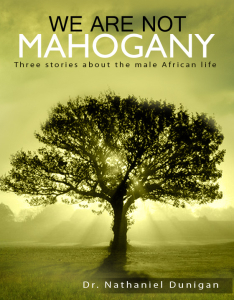 Below is the first chapter of Nathaniel’s new book, “We Are Not Mahogany: Three stories about the male African life,” now available on Amazon.com. These short stories capture his dissertation findings. The book also includes a study-guide and analysis that might serve educators, counselors, clergy and aid workers in the region. We hope you find it of meaning and use. My name is Thursday. They call me that because I was born on a Thursday. I hate my name. The year is 2001, and I am 15 years old. I grew up in a classroom. My mother was very young when I was born. Until I was old enough to go to school on my own, everyday she would use a kitenge to tie me onto her back, and carry me to school. There, she would lay out the kitenge on the cement floor in one corner of the crowded room where her mom, my grandmom, was a primary school teacher. I still remember playing in that corner, and the feeling of being wrapped up on her back as she made the long walk home on the red dirt streets of Kampala. Motorcycle taxis, called boda-bodas, zipped past us on all sides, hooting at us with their squeaky little horns, while giant Maribu Storks lumbered around us, picking at the garbage piles that lined the streets. When we would get home, Mom would either give me sugarcane to chew on or a cup of milk chai to drink, depending on whether it was the hot, dry season, or the cold, rainy season. When I completed Primary 7 at school, my grandmom also retired from teaching. This meant that there was no money for school fees, so I have had to sit at home since. I don’t know who my father is, and that disturbs me a lot. When I ask about him, I am ignored. This means I don’t know which clan I belong to or anything about my lineage. This is a problem. It also means that I don’t know which clan I cannot marry into, and I don’t know where I will be buried. You see, I am meant to be laid to rest with my father’s family, but I don’t know where their graves are. Many times my friends have found me seated and keeping quiet. When they ask me what’s wrong, I reply, “I am having my own problems,” like that. But these days they are used to me because whenever they find me like that, my grandmom calls me and tells me, “No, don’t think of that,” and she tries to encourage me. There are many people in our small house today. I don’t know exactly how many. The house is made up of seven rooms, and as always, every door is closed. We received a visitor two days ago; a woman a bit older than Mom. They told me that she used to work here as a housemaid. When you first enter our house, you find a room lined with furniture. To the left of the door is a large, stuffed armchair covered in maroon and gold fabric with gold tassels dangling from each arm. Next to it is a sofa with bright blue and green stripes. This one is my favorite because it extends to the corner and is under the window. When I can’t fall sleep on the mattress that I normally share with my cousin, I come to this sofa, and it always makes me sleepy. There is another sofa just like it on the opposite wall, but there are doors on each side of it, one leading to the kitchen, and the other to the bathroom. I hate sitting there, let alone sleeping there. Off of the hallway are four rooms that we use for bedrooms. Grandmom’s room is the last one. I have only been in her room once in my lifetime. In the kitchen, cooking is done on a charcoal stove on the floor. We do our washing outside, by hand. I wash my clothes and my mom’s, except for her underclothes. In Uganda, everyone washes their own underwear. I am told that even President Museveni washes his own shorts! Dinner tonight was my favorite: rice, beans and avocado. I am not sure who prepared it, but they used enough garlic and salt to make it perfect. We were gathered in the sitting room after dinner when my grandmom suddenly said, “That one is your real mom,” she used her lips to point to the former housemaid, our visitor. “What? What do you mean?” I ask. Nothing further is said to me. And I don’t know what to say or do. One of my uncles switches on the radio. It’s 11pm. Everyone begins to listen as the announcer reads personal notices, hoping to hear messages from family upcountry. People often go to their local office of the national radio station, and pay a few hundred shillings to send greetings or death announcements to family in other parts of the country. I get up and go outside. It’s very dark. The electricity has just gone out again. This is the fifth or sixth time today. I have lost count. Street vendors at the corner are lighting candles to illuminate their wares: matchboxes, batteries, candles, tiny bars of soap, salt, and flip-flop shower shoes. I hear a baby crying next door, and in the distance, the sounds of lorries beginning their late night trek across eastern Uganda to collect imported items at the Kenyan border. Items that originated in Europe and India, then shipped across the Indian Ocean to Mombasa, and then through the entire expanse of Kenya before finally reaching Uganda. Some of the items will remain here, while others will be taken to the Congolese border to the west. I make my own journey down our dark street, and call out for my friend in the direction of his house. No response. I call out several more times. Finally, he opens his front door, and comes to greet me. “Don’t call me that. You know I hate my name,” I say. “Who told you? Which woman do you mean? Be clear,” he demands. And I explain. He takes my left arm by wrapping his right hand around my wrist, and he pulls me to the broken stoop in front of his house. We sit. The uneven concrete has captured some of that afternoon’s rain, but I don’t care. “I feared telling you who she was,” he says. He raises and drops his eyebrows in one dramatic movement. This means yes. I shook his hand free from my wrist and walked away, but I didn’t go home. “None of this is true. People are just lying, the usual sadists trying to cause damage,” I tell myself. I wait outside until my house has gone quiet before I reenter. Once inside, I lay down on the blue and green sofa, but tonight I fail to catch sleep. They expect me to believe that behind one of these closed doors is a stranger who is my mother, and an uncle who is my dad. To read the rest, simply purchase your copy or Kindle version at Amazon.com.